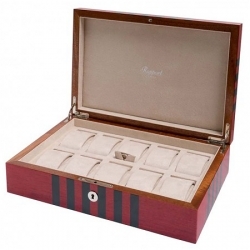 Keep your valuable collection of timepieces safe and all in the same place using this eight watch collector box L421, a member of Heritage series produced by Rapport of London in United Kingdom. 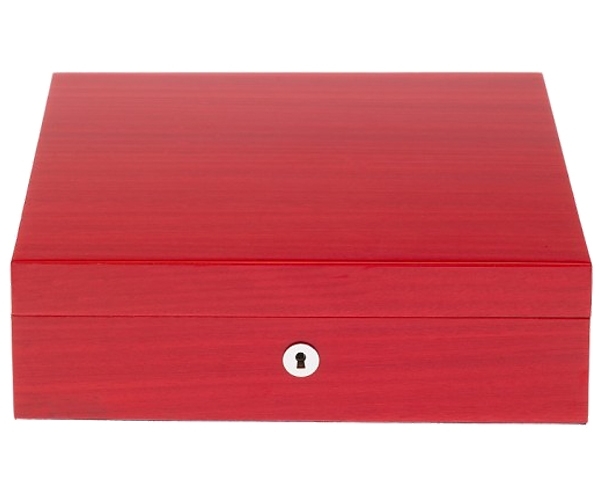 The storage is masterly manufactured from solid wood with high-gloss lacquered crimson red stained finish. The interior features 8 individual compartments that lined with soft red suede material. There are removable padded cushions to keep your valuable watches protected. The case is accented with chrome hardware, and can be locked with a supplied key. It measures width of 11 4/5 inches, depth of 10 inches and height of 3 1/2 inches. This is a right choice if you're looking for the highest quality. We are an official dealer of the brand. You'll get factory warranty and free domestic shipping for this item.